When studied with advanced microscopic and imaging techniques, the brain of a fruit fly reveals astounding complexity, showing its composition by many discrete building blocks called "neuropils," each comprising one or more complex neuronal circuits. Credit: Kei Ito et al. (Medical Xpress)—When you're talking about something as complex as the brain, the task isn't any easier if the vocabulary being used is just as complex. An international collaboration of neuroscientists has not only tripled the number of identified brain structures, but created a simple lexicon to talk about them, which will be enormously helpful for future research on brain function and disease. Nick Strausfeld and Linda Restifo, both professors in the Department of Neuroscience at the University of Arizona, worked with colleagues in Japan who led the project, and colleagues in Germany and in the UK to produce a comprehensive atlas of neuroanatomical centers and computational centers of the insect brain. In the process, the team identified many previously unknown structures. By providing the research community with a unified system of terminology, they set the stage for a systematic effort to elucidate brain structures and functions that carry over to functions of the human brain. An article about the work appears in the scientific journal Neuron, regarded by many as one of the flagship publications of neuroscience; the online version includes an 80-page data supplement. The data will be publicly available within 6 months and include hundreds of images and 3-D video animations – amounting to an invaluable resource that will enable neuroscientists to work more efficiently, compare their results and obtain more meaningful interpretations. "This effort provides a three-dimensional road map for describing structures for all insect brains, and enables comparisons with other arthropods," said Strausfeld, director of the UA Center for Insect Science. "It has huge value in describing network relationships between computational centers in the brain." The project is timely as the U.S. and Europe have embarked on ambitious initiatives – President Barack Obama's BRAIN initiative and the European Union's Human Brain Project – to produce a dynamic picture of the brain that shows how individual cells and complex neural circuits interact in time and space. In their efforts to develop strategies to explore the inner workings of the human brain, likely the most complex structure in the solar system, scientists have relied on studying the brains of model organisms such as fruit flies because their structures are simpler and easier to study in experiments. Arthropods – insects, spiders, crustaceans and their kin – have advanced biomedical research ranging from the anatomical and molecular underpinnings of behavior to the biochemical causes of addiction. 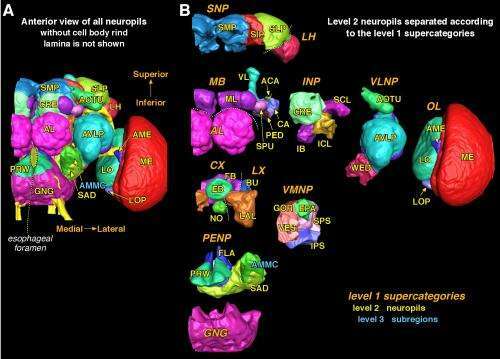 Because of their shared evolutionary history deep in time, vertebrates including humans likely share many of neuroanatomical features and functional centers in the brain with invertebrates. Studying neurological processes in arthropods can significantly help us to understand how all brains work. The processes leading to Parkinson's disease, for example, are extremely difficult to investigate in humans, but research with fruit flies has yielded valuable information that could help neurologists develop therapeutic strategies. 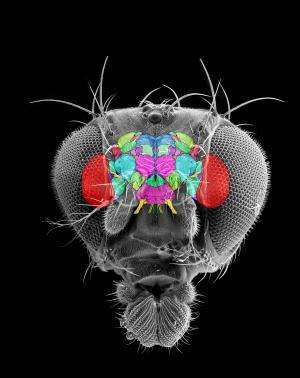 As a result of this joint effort to catalog and map the insect brain, this group of scientists has discovered that the pinhead-sized brain of a fruit fly has more than 50 anatomically distinct centers approaching a complexity until now only recognized in animals such as fish or mice. Multiple labeling with antibodies specific against various neural proteins reveals different regions, cells, fibers and connections of the brain of the fruit fly, Drosophila. Shown here is the left hemisphere seen from the front. Credit: Kei Ito et al. "There are fascinating parallels," Strausfeld said. "By recognizing discrete centers in the insect brain, we will better understand how elaborations of the brains of insects and vertebrates might relate to each other despite more than 600 million years of divergent evolution." For example, the olfactory bulbs in vertebrates are very similar to the olfactory lobes in crustaceans. The same goes for the visual system: Color, shape, motion and texture are similarly processed in vertebrates and insects, although very different aspects of the visual world are perceived by a fly compared with those perceived by a monkey or a human, Strausfeld explained. The study was led by Kei Ito, an associate professor in the Department of Computational Biology at the University of Tokyo. 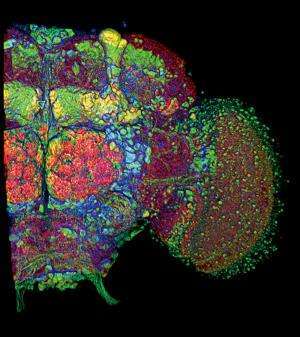 His group used a technique called confocal fluorescence microscopy to create virtual "slices" revealing the fruit fly brain architecture down to single cells. Five years and 1,200 emails later, the project now provides neuroscientists with the same terms to describe specific parts of brains of insects and crustaceans. "We are setting a new standard that really enables communication," the UA authors agreed. "We now have a very detailed understanding of the distribution of neurons in discrete centers and the connections amongst them," Strausfeld explained. "The complexity of insect behavior is increasingly recognized by the genetics community to allow us to model various human diseases," said Restifo, who also is professor of neurology in the UA College of Medicine and member of the UA BIO5 Institute. "These tiny, but now well-defined, regions we see in the insect brain probably have particular neurons with particular connections driving certain behaviors that are becoming ever more important in studying behavior like aggression or addiction." Restifo explained that combining the expanded behavioral repertoire of humans with that observed in insects makes a strong case for using model organisms such as the fruit fly, Drosophila, in the quest for new drugs. "In some ways, insects are going to be even more useful than rodent models," she said. "In some cases, efforts to get to the cause of a disease by disrupting gene function in mice fail to provide answers because even though the genetic mutation matches that of the human disease, the physiological effects don't." To be meaningful, any study of complex nervous systems requires concepts and terminology uniformly agreed upon by the research community. Neuroscientists have long known that anatomically distinctive regions are clues to how the brain is organized, but different terms have been in use for the same structure in different – or even within the same – species. "In reality, a rose by any other name is more like a Tower of Babel," Restifo said. "There has been enormous confusion." Strausfeld, who published the first atlas on the insect brain in 1976 – and, together with Ito and colleagues in Germany, the first National Science Foundation Online Atlas of the Drosophila Brain – established much of the initial nomenclature. The UA Center for Insect Science also was instrumental in supporting the efforts that led to the study's publication. Strausfeld said an important driver of the present project was the need to establish the appropriateness of specific terms and names for neural structures across arthropod brains. "Nothing quite like this has been done before," he said. "Scientists studying the brains and behavior of birds had come to an agreed-upon nomenclature, but we were trying to find common ground across many species that may be more distinct from each other in terms of evolutionary divergence. Thus, adding to the enormity of the task was the goal of agreeing on terminology that would 'fit' for all insects and be applicable to crustaceans." "Developing a standardized nomenclature is important because it facilitates cross-fertilization of work done using different insect species," said Gerald Rubin, vice president and executive director of the Janelia Farm Research Campus of the Howard Hughes Medical Institute. "Pulling this together required a lot of work, scientific insight and historical knowledge; it was a real service to the field."